These quilted cushions will instantly add comfort and style to your chairs. Two piece set includes one back cushion and one seat cushion. 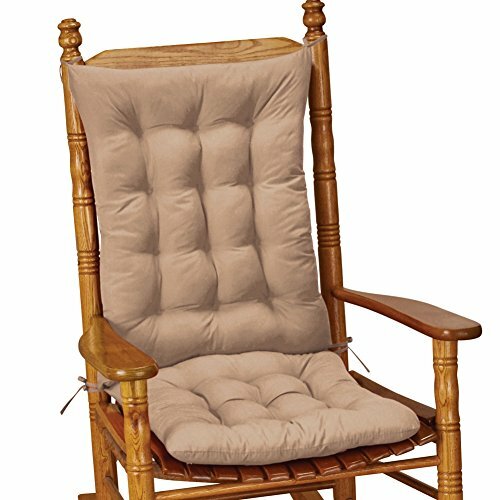 The back cushion has four ties and the seat cushion has two ties to hold it securely in place. Perfect for a rocking chair, dining chair or armchair. Spot clean. Polyester and cotton; imported. Chair cushion is 19 1/2" x 17 1/2", back cushion is 23 3/4" x 18 3/4. Color available in Beige, Blue, Burgundy or Green. Quilted cushions will instantly add comfort and style to your chairs. Two piece set includes one back cushion and one seat cushion. The back cushion has four ties and the seat cushion has two ties to hold it securely in place. Perfect for a rocking chair, dining chair or armchair. Spot clean. Polyester and cotton. Chair cushion is 19 1/2" x 17 1/2", back cushion is 23 3/4" x 18 3/4.